Watching sprinters Ronnie Baker and Noah Lyles set personal-best and world-leading times hasn't discouraged or intimidated one of the freshest faces on the Diamond League circuit. Instead, Christian Coleman was motivated by the success of his fellow Americans while recovering from a right hamstring injury. ​"It was preparing me emotionally to know when I come back I'll be able to compete," Coleman said on the phone from Rabat, Morocco, where he will return from a six-week absence to run the men's 100 metres on Friday at 4:30 p.m. ET. "I know how fast and competitive they and they'll be running at a high level. "I know my time will come, so I just have to stay focused on the goal." Friday's track and field meet will be streamed live at CBCSports.ca, starting at 1 p.m.
Coleman, who hadn't previously experienced hamstring problems, confirmed he is 100 per cent healthy and said Friday's race will be the first time this season he has had "full confidence" in his right leg. Coleman first hurt his hamstring in training in early May and was forced to withdraw from Diamond League Shanghai on May 12. He returned May 26 at the Prefontaine Classic, admittedly at less than full health and with little training, to finish second to Baker (wind-assisted 9.78 seconds) in 9.84. Five days later, Blake prevailed at the Golden Gala in Rome in a then-world-leading 9.93 while Coleman was fourth in 10.06 but aggravated the injury and missed subsequent Diamond League meets in Oslo, Stockholm, Paris and Lausanne, Switzerland. Despite Coleman's impressive results, Donovan Bailey doesn't feel he has put together a three-phase race outdoors this season after setting a world indoor 60 record of 6.34 seconds in mid-February at the U.S. indoor national championships. 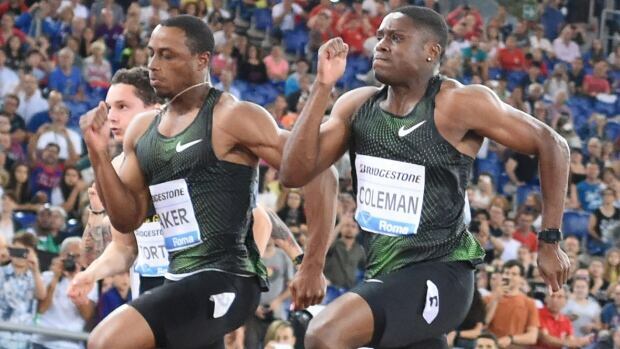 The CBC Sports analyst believes Coleman needs to lengthen his strength to reach his top-speed threshold further along in the 100 than he was earlier this season and improve his physical strength to maintain his composure over the final 20 metres. "He's the fastest kid out there and his upside is fantastic, but he has the most work to do technically. Christian has had problems when he hits top speed to the last 30 metres," Bailey said of the 2017 world 100 silver medallist. "One of the things you have to do in the middle of a race is breathe. When you breathe, it allows your diaphragm to stay high. "From a technical perspective, breathe, relax, keep your shoulders pumping and it should be a hell of a race between him, Noah Lyles and Ronnie Baker [in Rabat]." Coleman recalled being in the "best shape" of his life during the indoor season and is confident of achieving more this summer. "You're always fighting for the win and that'll push you to great heights," he said. "You can worry about technique, form and [your] time another day." "I've improved overall as an athlete, in terms of the weight room, my times in practice, my core strength," he said. Baker ran 6.44 at indoor worlds in March and Bailey noted his ability to stay close to Coleman during an indoor race helped build his confidence for the outdoor season. "He understood what Christian's rhythm is and probably a whole lot of Christian's strengths and weaknesses, and he's banking on his strength against Christian's weakness." At the USATF outdoor championships on June 20, Lyles won in a world-leading 9.88, Baker was second in 9.90 and Michael Rodgers, the fourth American in Friday's nine-man field, clocked 9.89 in the first round. "Noah Lyles is the guy I'm watching," Bailey said. "He's not going to panic and he's proven that in many races, and that's what makes a champion." Baker, 24, dropped his time to 9.88 for a PB at the Meeting de Paris on June 30 for his third Diamond League victory and tops the standings with 16 points, two more than Jimmy Vicaut of France. Great Britain's CJ Ujah and Reece Prescod are the other notable sprinters in Friday's 100. Ujah won last year in Rabat in a meet record time of 9.98 while Prescod captured the 100 this season at Diamond League Shanghai and the recent British championships. Shawn Barber, men's pole vault (2:30 p.m. ET): Barber successfully defended his Canadian title last weekend in Ottawa, improving his meet record by clearing 5.75 metres. The 24-year-old cleared 5.84 at Diamond League Paris on June 30, representing the Toronto native's best performance since his 5.92 at the Texas Relays on March 31. Brittany Crew, women's shot put (2:23 p.m. ET): Crew, 24, broke her own Canadian record in the shot put late last month with a throw of 18.60 metres at the IAAF world challenge meet in Madrid. The 2018 Commonwealth Games bronze medallist from Mississauga, Ont., followed with a winning throw of 18.27 at the national championships in Ottawa. Matt Hughes, men's 3,000m steeplechase (4:46 p.m. ET): The 2017 world championship finalist made it five Canadian titles in the past six years (he missed 2016 due to injury) last weekend in Ottawa, clocking 8:54.00 to win by more than three seconds. In April, the 28-year-old native of Oshawa, Ont., placed fourth in a season-best 8:12.33 at the Commonwealth Games.